Our friend Jess has a specialty – she makes these tasty taco wraps and they’re really simple. We’ve made them for fast weeknight dinners as well as to serve to guests – both vegan and non-vegan! Everyone has loved them. The taco wraps are familiar, filling and comfortable with usual Mexican flavors all wrapped up in pastry. It’s also an ideal finger food! Jess got this idea from her Mom, who used to make a similar non-veg dish. So she took a favorite childhood memory, and re-invented it! Thanks, Jess, for sharing! 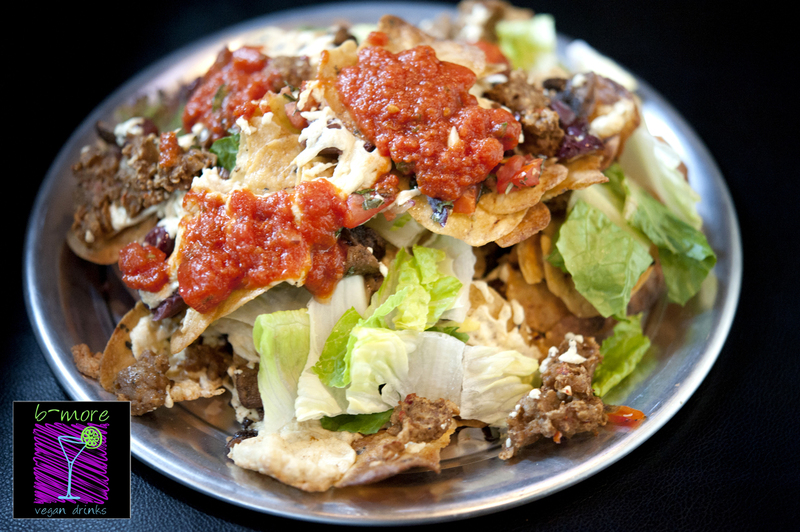 to serve, salsa, vegan sour cream, lettuce, green pepper slices. Pre-heat oven according to Cresent roll package (each brand will vary; it’s usually about 375). Pop open the Crescents and unroll them onto an ungreased baking sheet. Set aside. In a pan, saute onion and garlic until cooked through and lightly brown, about 3-5 minutes. Add Gimmee Lean and taco seasoning mix. Combine with onions and garlic, and saute until Gimme Lean is slightly crisp. If you need to, add a few spoonfuls of water to really get the taco seasoning to blend into the veggies and Gimme Lean. Spoon a small mound of the Gimme Lean and onion mixture onto each unrolled Crescent, top with a pinch of Daiya Cheddar, and roll them up in any style you like. Bake according to directions on Crescent package. To eat, serve on a bed of lettuce and green pepper slices, and top with salsa and vegan sour cream! Wonderful! Cooking note: You can really mix it up with this recipe – try adding chopped pepper to the filling when you saute it. Or make a breakfast version with the Gimme Lean Sausage flavor. Want to up the cheesiness? Add in some nutritional yeast to the filling mix. It’s lots of fun to make these – and even more fun to eat them! The brand is Watoto From the Nile Raw Kale. The flavors we sampled at Sweet 27 were Sour Cream and Onion (vegan! ), Curry and Sea Salt & Vinegar. They’re made in Baltimore and are so allergen-friendly, it’s amazing. No nuts! No gluten! No dairy! Kale chips are high in fiber & iron, contain antioxidants, vitamins K, A & C, and calcium. Basically, kale is something you need to eat. All the time. And why not in the form of savory, crispy kale chips? 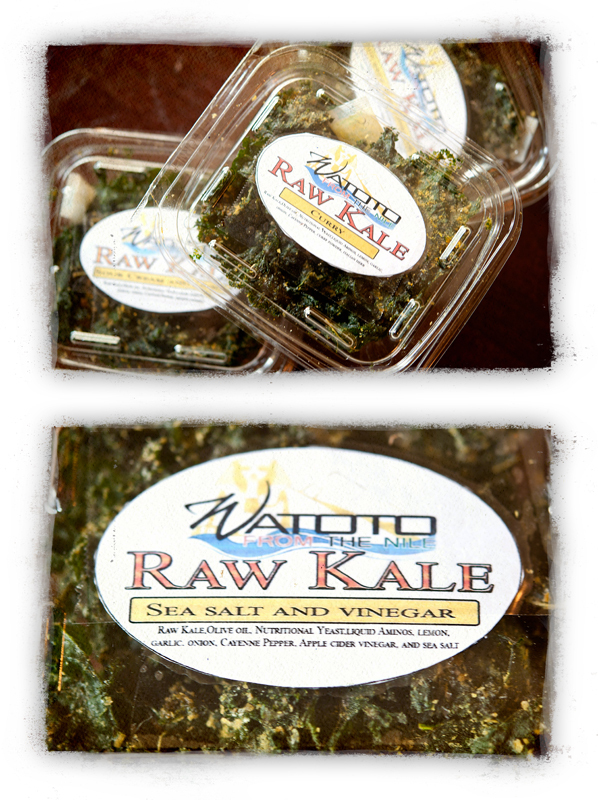 These Watoto From the Nile Raw Kale chips are divine! We can’t find a website or Facebook page for this company. We picked up their flyer and it only listed a phone number: 410-303-4120 – you can call to place an order for wholesale or retail. Or just swing by Sweet 27. They will be glad to help you get your kale-chip-fix on! 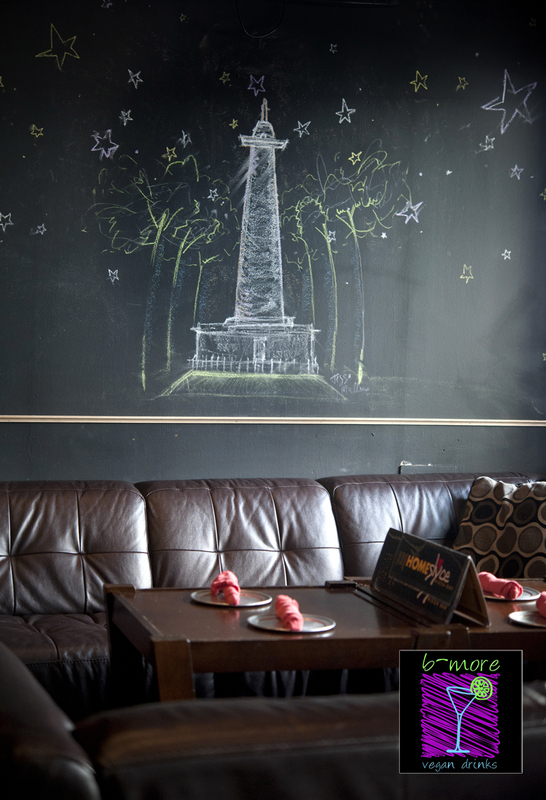 Baltimore Vegan Drinks – Coming to HOMESlyce! We’re big fans of Baltimore Vegan Drinks. This month, the event will be at HOMESlyce in Mt. Vernon. The pizza is crazy good. 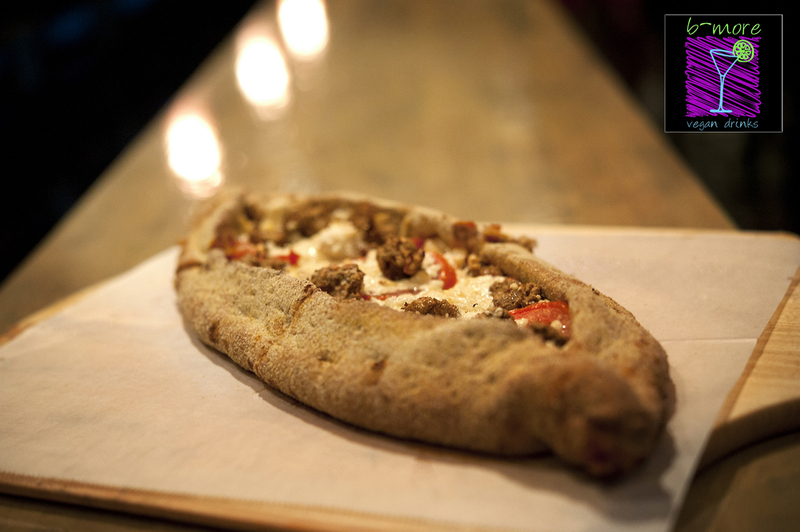 The calzones are crazy good. You’re in for a real treat. 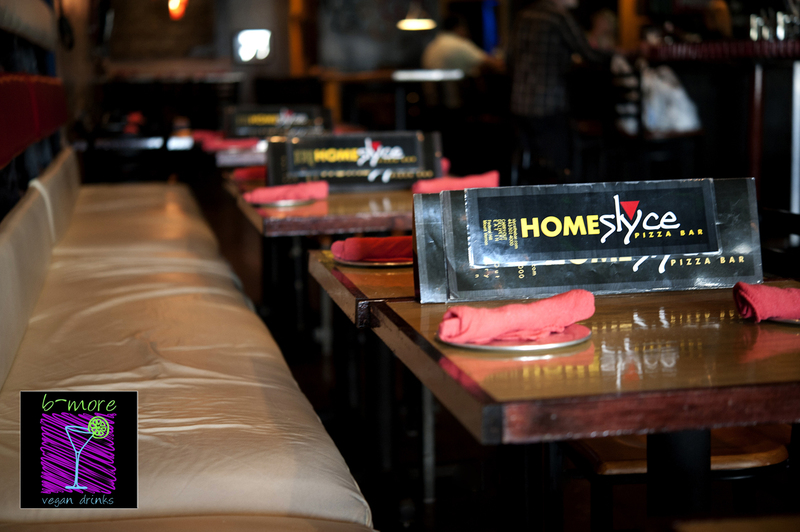 HOMESlyce is located at 336 N. Charles Street in downtown Baltimore. Parking is available on-street. 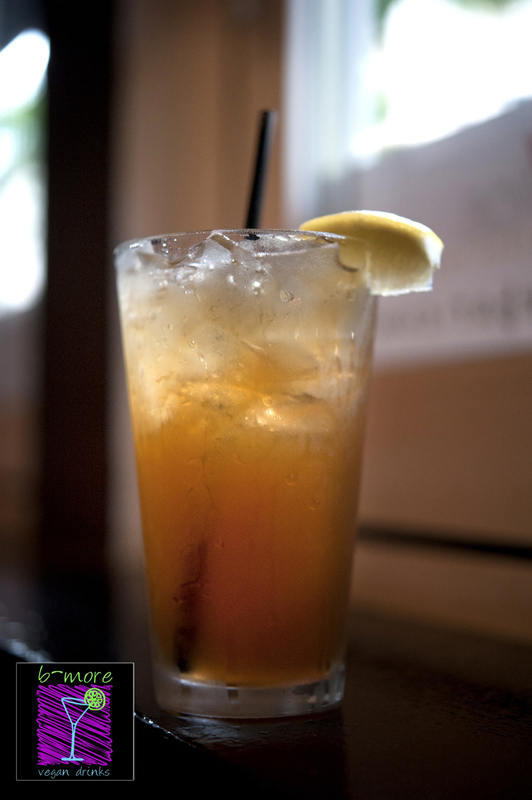 Texas Peach Tea – a delicious vegan cocktail! These nachos are roughly the size of a trough. No joke. Made with Lightlife vegan sausage, Daiya cheese, garbanzo chips and loads of veggies and salsa. It’s plenty to share – or have as an entree. 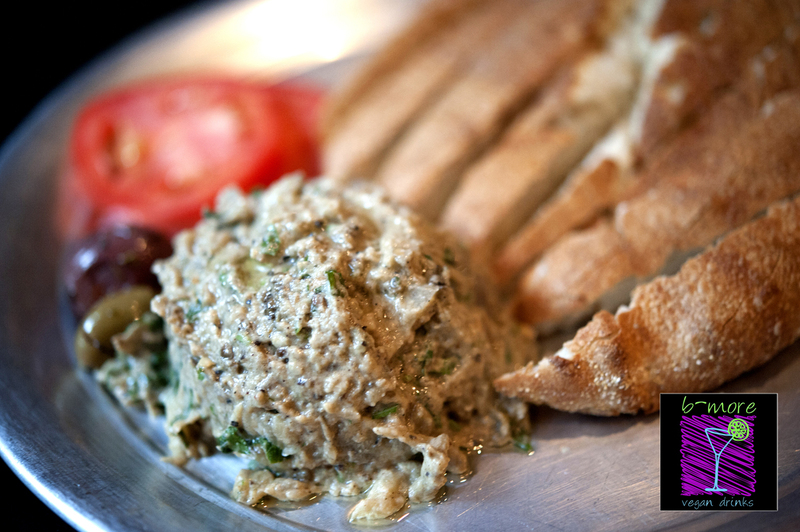 Baba Ghanoush with house-made bread sticks. 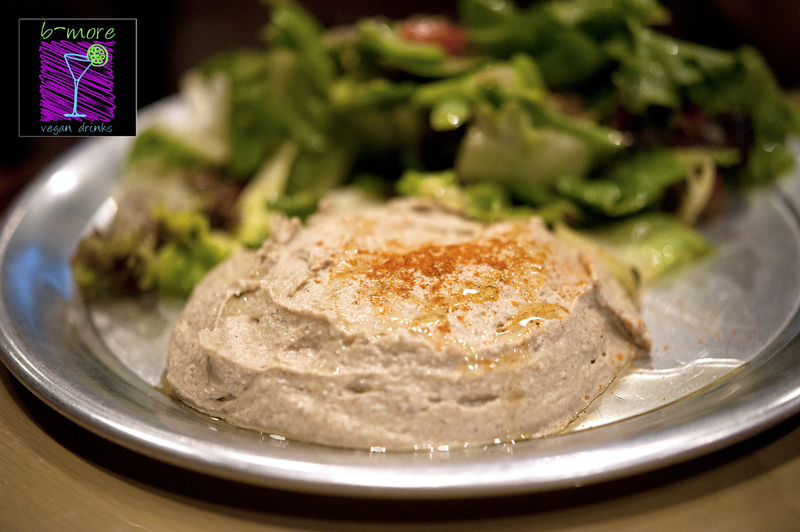 Hummus and a house salad. 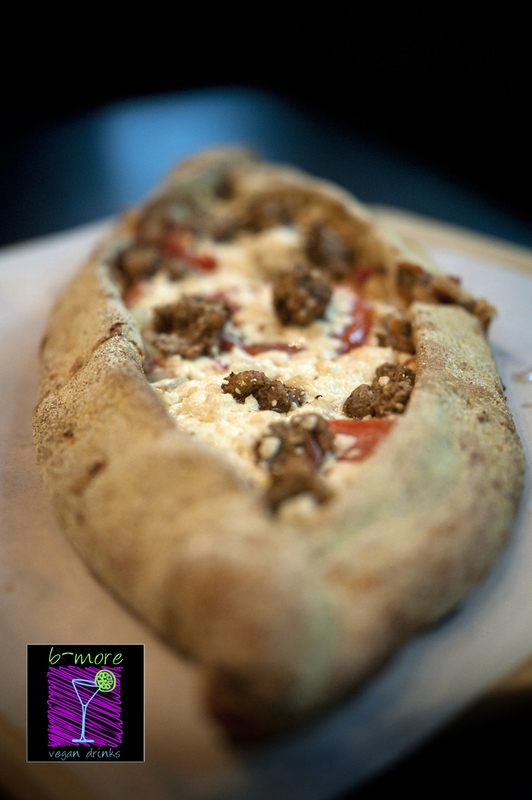 Calzone! 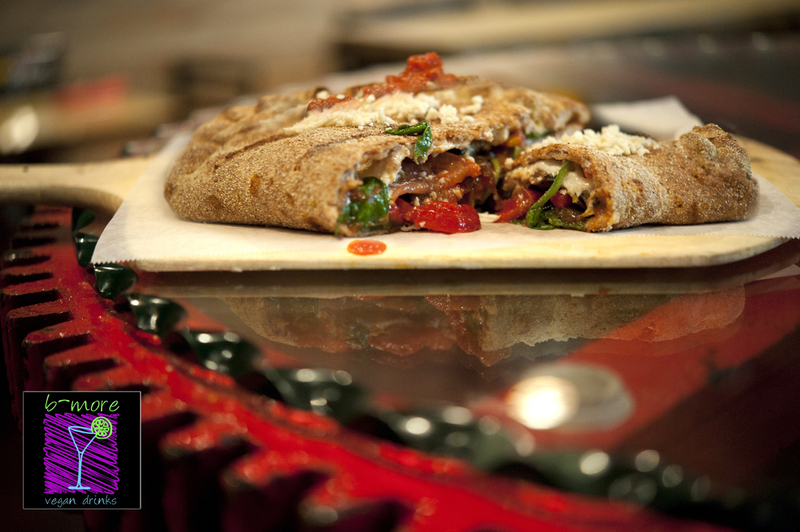 Stuffed with roasted eggplant, spinach and Daiya cheese. 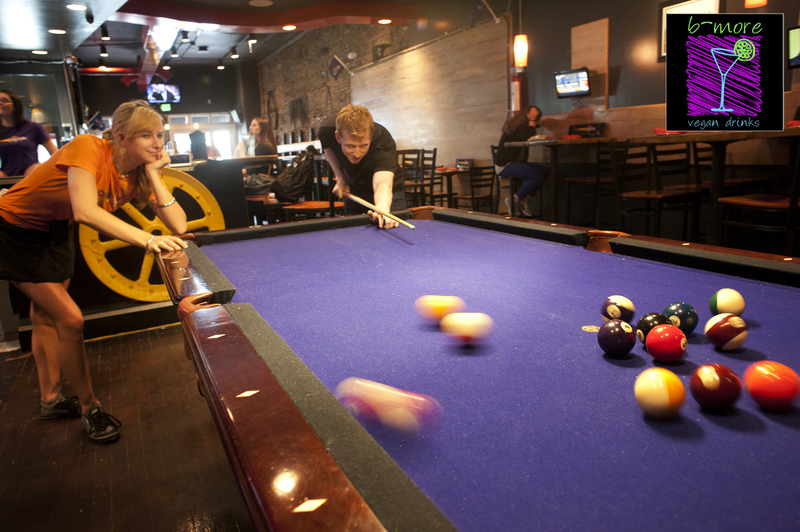 Wanna play pool? 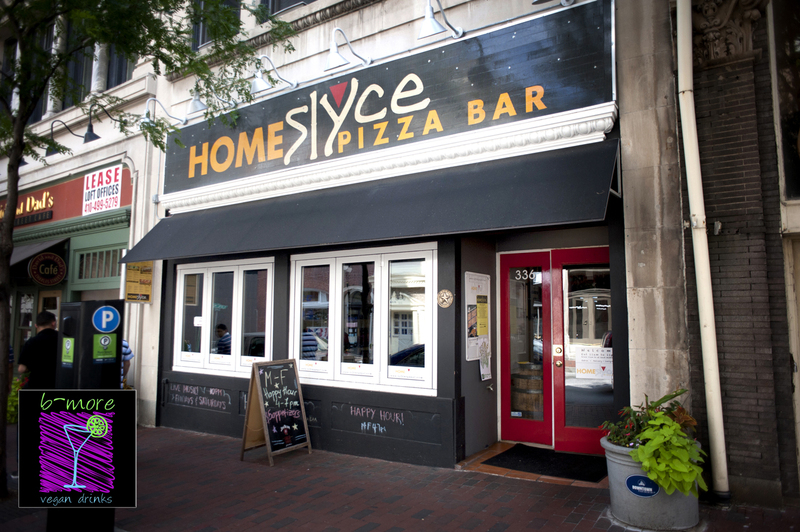 HOMESlyce – the perfect place for Baltimore Vegan Drinks. See you there on Monday July 22nd, 2013 from 7pm to 9pm! Aren’t tomatoes one of the best things about summer? We think so. It’s about this time of year when we start to have loads of them – both from our yard and available at every Market or Farm Stand. So celebrate those gorgeous orbs of red, yellow and green. 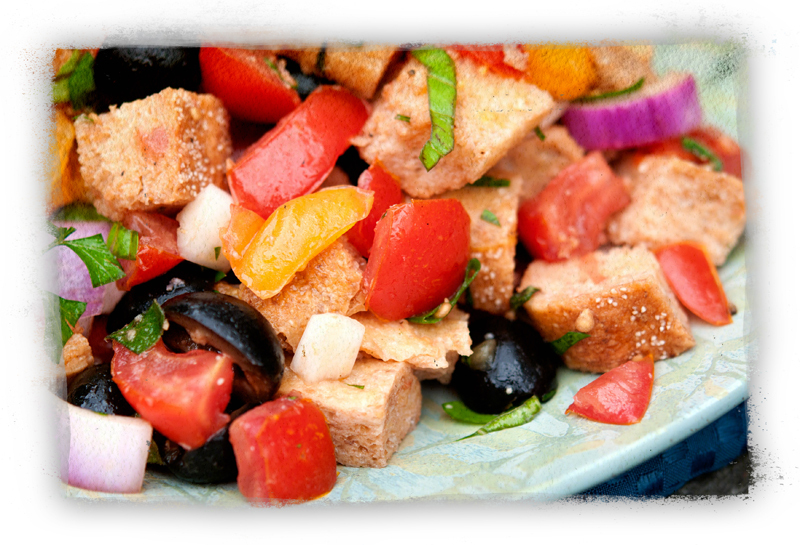 We had friends over, who also happen to keep the wildly popular blog, Jes’ Delights and shared our old-fashioned recipe for Panzanella. 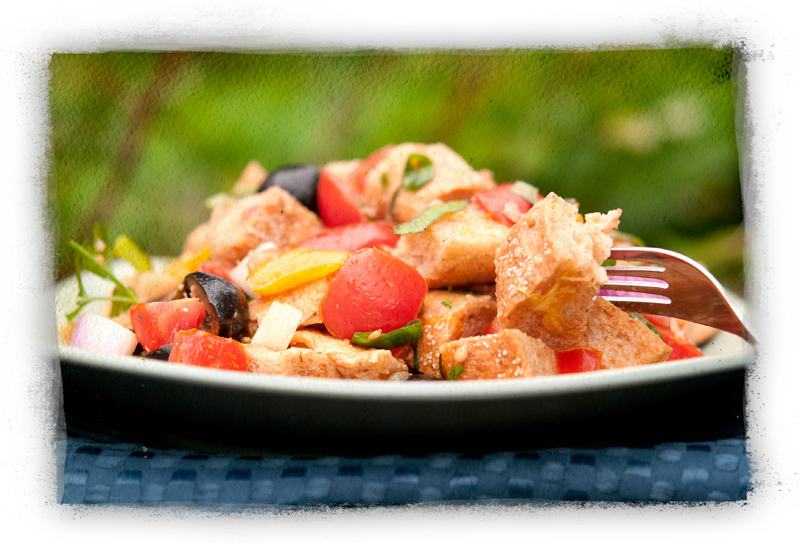 This is a traditional Italian peasant salad and a perfect use-up for all those tomatoes or stale bread. And truthfully – we have yet to meet the guest who didn’t love this recipe. We’ve served it dozens of times to vegans and non-vegans. Always a hit. Always flexible. You can follow the recipe closely – or improvise. Add some peppers. Try different vinegar. It will bend to your will and stay delicious! Since Jes is posting this recipe today, you need to visit her blog. The recipe is waiting for you there, along with many other fun ideas, stories and more! Enjoy exploring Jes’ Delights and we will see you again soon!